The Zero Bill: Is it real? Zero bill clients are starting to pop up from different cities: Makati, Muntinlupa, Quezon City. In the Philippines, solar systems, something perceived by many as a mystery, are now fast becoming a reality to them. Let us take a look at Lito, a client who lives in an exclusive, gated subdivision in the prime center of Makati City. 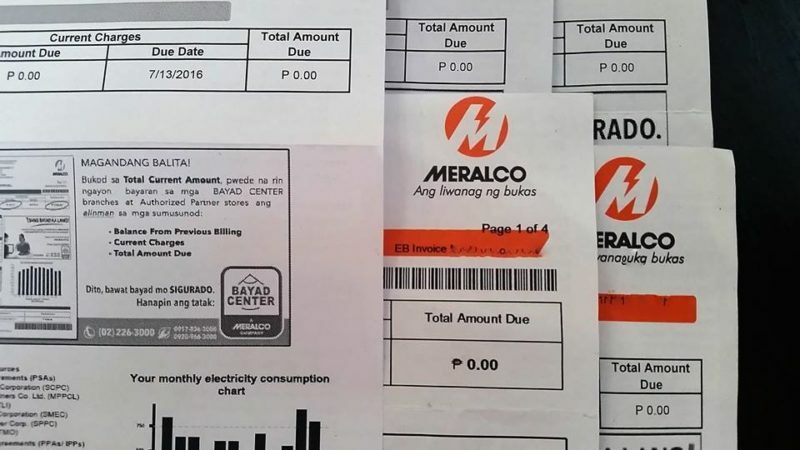 His electric bill averages to about Php30,000 each month. His household daytime appliances include a washing machine, three television sets, a dryer, a chest freezer, five air conditioner units, and a swimming pool pump. Six years ago, he installed a 5 kWp grid-tie solar system and registered for Meralco’s Net Metering Program with Peak/Off-Peak (POP). Less than a year later, his electric bill hit zero. Yes, the total amount due was a whopping Php0.00. What does the zero bill translate to? It means that the household now uses the sun as a means of power, especially during the daytime. Laundry can be done daily using the washing machine and dryer, without worrying about the power consumption of the dryer and its peso equivalent. A zero bill means all aircons in the house can be turned on during the daytime, and family members can lounge around indoors, feet propped up on the couch, with Netflix and popcorn, in the luxury of guilt-free AC. Why? The investment in a solar system in the Philippines pays off. ROI is typically within 3 to 5 years. The benefits are forever. When Filipinos contemplate on buying rooftop solar, people have a wide range of reasons and reflections. Some want to save money. Some want to profit. Some want to keep up with the pace of technology. Most want to be smart: they want to consume power and produce power at the same time. Installing rooftop solar is a win-win decision for everyone and everything: homes, factories, warehouses, storage facilities, cold storage plants, establishments, farms, hotels, resorts, hospitals, schools, buildings, and more. Everyone wants to be paid for providing clean solar power to the grid. The only way to do that is to get solar. At the same time, you contribute to a clean, safe, healthy, sustainable, and renewable future. There are various ways to set up solar so that you will never have to pay for power again. Check out our website for a free site inspection today. The leading option that has become the nation’s trend is installing a large solar power system because that is how to guarantee a zero bill. Learn more about solar power systems and solar panel prices here. A large solar power system makes sense both financially and environmentally. Buying and installing solar increases your property value. Whether you install solar at the house, office, building, warehouse, factory, farm – the market and property value increases. Now, with more people becoming even more educated about solar, the demand for solar properties is the highest it has ever been. The best option to guarantee a zero bill is to install a large solar system, one with enough rooftop solar so that the credits you receive from the utility company from exporting surplus electricity reduces your bill to zero. In other words, the surplus electricity from your solar system will be exported to the grid. This will offset your consumption from the grid. In layman’s terms: have a solar solutions team install plenty of solar panels on your roof and generate enough power. Then export this power to the utility company. In doing this, you do not have to pay a single centavo on your electric bills. Better yet, you get paid for the electricity that you will provide. The zero bill is a benefit from being a consumer and provider. Solaric is the recognized king of rooftop solar. Solaric has established its name across the renewable industry as a proven and reputable rooftop solar leader. Backed by decades of experience, Solaric has installed more than 50% of residential rooftop solar in the Philippines and has delivered significant cost reductions in electricity expenses, as well as milestone contributions to a cleaner, greener, and renewable future. Solaric is now becoming the recognized leader in corporate and industrial solar projects. The Solaric installers and engineers are well-known troubleshooting experts. They work hard to ensure that solar panel systems run efficiently and seamlessly so that everyone with rooftop solar can enjoy the benefits of clean and renewable power. Welcome to the new generation of solar and turning on the sun. For the future. Do you know anyone interested in installing solar? Help them out by sharing this article with them!